The RSS Feed allows you to output an RSS feed from your site. First you configure an Asset Listing page to generate a list of assets that you want to output and then create an RSS Feed that points to that Asset Listing page. 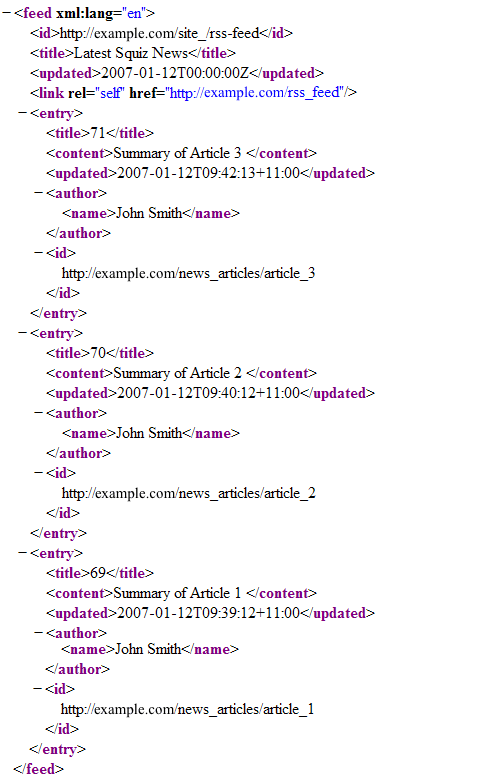 You then configure the RSS Feed to pull information from the listed assets into XML tags. Once your RSS Feed is created, you can configure its settings on its associated asset screens. The majority of these screens are the same or similar to those for a Standard Page and are described in the Asset Screens manual. In this chapter, we will describe the Details and Build RSS screens, which are different for an RSS Field. The Details screen allows you to select the RSS Format for the RSS Feed and configure the Asset Listings to use in your feed. For more information about the Status, Future Status,Thumbnail and Details sections, refer to the Details Screen chapter in the Asset Screens manual. This section allows you to select the format of the RSS feed and whether or not to use HTTP authentication. RSS Formats: select which RSS Feed format you would like to use. These options include RSS 1.0, RSS 2.0 and Atom 1.0. The default value is RSS 1.0. Use HTTP Authentication? : select whether or not to allow restricted access to the RSS Feed. If this is turned on and public read permission has not been granted to the feed, when the user tries to access it a HTTP 401 Unauthorized header will be returned. This allows authentication details to be received from the user's client, be it a browser or feed reader. 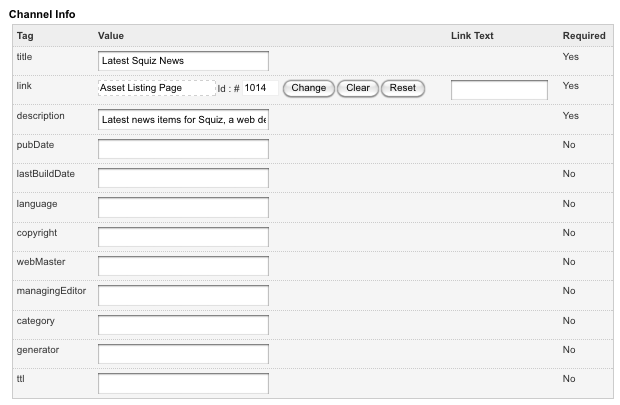 These details are then used to log into Squiz Matrix and access the feed. If the user does not have read access to the asset, it will be treated as a failed login and a 404 header will be returned again. If authentication is canceled on the user's client, the Squiz Matrix login screen will appear. By default this option is set to No, hence it is turned off. This section allows you to select which Asset Listings you want to use in your RSS Feed. Select Listing Engine Assets: select the Asset Listing you want to use in your RSS Feed. Number Of Assets To Be Added In The RSS: specify the number of assets to be included from each Asset Listing. For example, if this field is set to 15, the top 15 assets of each Asset Listing would be included in the RSS Feed. The default value is 0 meaning that all of the assets from each Asset Listing will be included. The Build RSS screen allows you to build what information will be included within the RSS output. This section allows you to select which information from the selected asset types you want to include in the RSS output. 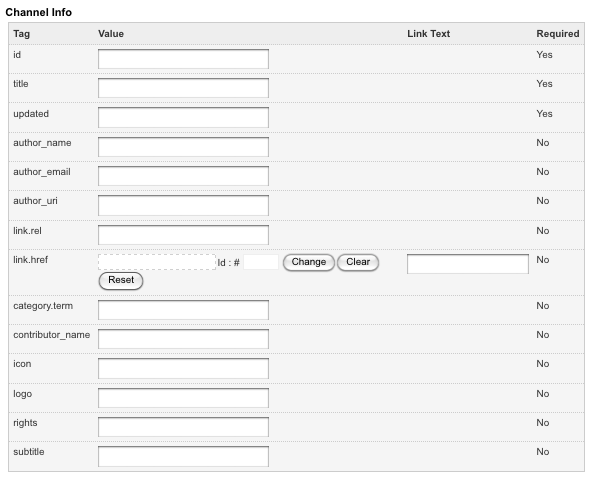 The Add A Keyword section of the Build RSS Screen is shown in the figure below. The asset types that you can select from will depend on which asset types have been included in the Asset Listing. For example, if you have selected to use an Asset Listing that lists News Items, then News Items will be included in the list of asset types. If you have not selected an Asset Listingon the Details screen of the RSS Feed, a message will appear in this section instead of a list. You will need to go to the Details screen and select an Asset Listing. Once you have done this, the Choose Asset Type list will appear, as shown in the figure above. From the list select the asset type you would like to edit and click Commit – additional fields will appear in the Add A Keyword section, as shown in the figure below. Choose/Enter Keyword: select the keyword replacement you would like to add to the RSS Feed from the list provided. If you would like to format a particular keyword or combine keyword replacements you can use the text box provided on the right hand side of the drop-down list. For example, if you want to combine the asset short name and version number for the title you can enter () into the text box. 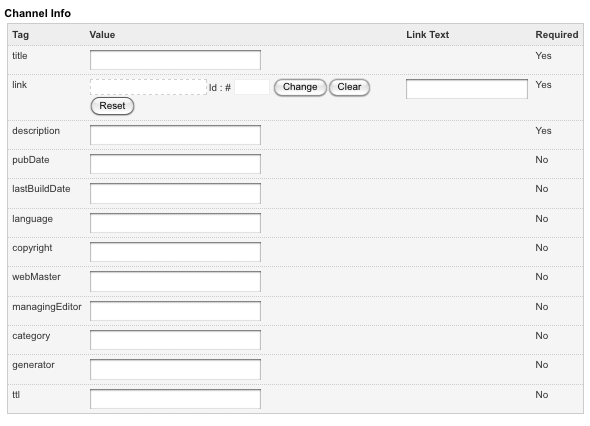 You can also use metadata fields as values. For example, if you had a Metadata Schema that had a field called Description, you can enter the keyword replacement into the text box. You can only use the keyword replacements available in the drop-down list provided. For some asset types, such as Standard Pages, these keywords may not include those required to print the content and other details of your listed assets. In such cases, you can use metadata keyword replacements as an alternative method to print this information. Choose Tag: select which tag in the RSS Feed you would like to use the keyword replacement for. For example, if you want to use the short name of the asset as the title, select the keyword replacement Short name of the asset in the field above and select title in this field. The title tag in the RSS Feed will be filled in with the short name of the asset. The list of available tags will change depending on which RSS Format is selected on the Details screen of the RSS Feed, with some fields being mandatory. The list of the available tags is as follows. RSS 1.0: title, description, link, and rdf:about. Tip: For RSS 1.0, you must fill out each of these tags for the RSS Feed to work correctly. RSS 2.0: title, description, link, pubDate, category, author, comments, guid, enclosure url =, enclosure length =, and enclosure type =. Atom 1.0: id, title, updated, author name, author email, author url, content, link rel =, link href =, summary, category term =, contributor name, contributor email, contributor url, source id, source title, source updated, source rights, and rights. Tip: For Atom 1,0, you must fill out the title, id, updated and author name tags for the RSS Feed to work correctly. To add additional keywords to the RSS Feed, select an asset type in the Add A Keyword section and click Commit – additional fields will appear in the Add A Keyword section, as shown in the figure below. Select a keyword replacement and a tag from the lists provided and click Commit. An additional row will be added in the Keywords As Items section. Repeat these steps to add further keywords to the RSS Feed. Once you have selected the keyword replacement and tags for the RSS Feed, an additional section called Keywords As Items will appear on the screen, as shown in the figure below. This section lists of the keywords and tags that have been added to the RSS Feed. To delete a keyword replacement and tag, click the Delete box and click Commit. To change what keyword replacement a tag is using, perform the same process as you would when you are adding a keyword. Instead of adding an additional keyword replacement for the tag, however, Squiz Matrix will replace the keyword that is currently being used. For example, if you wanted to change the keyword for the title tag to Asset Name, you would add a new keyword and select Asset Name as the keyword replacement. When you click Commit, the keyword replacement for title will be changed to Asset Name. To delete a keyword, select the Delete box in the Keywords Selected section and click Commit. The keyword will be deleted and will no longer appear in the Keywords As Items section. 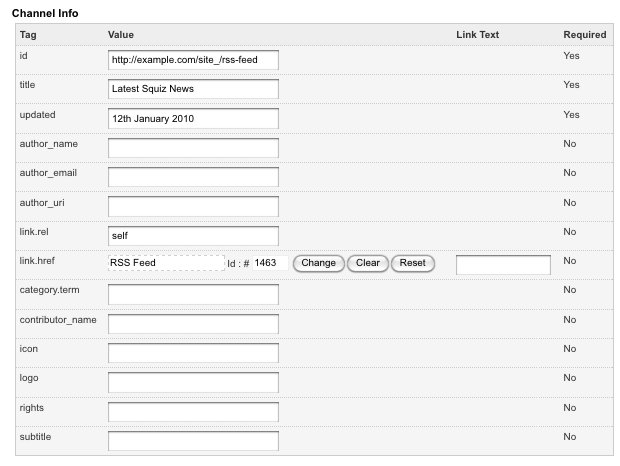 This section allows you to add the information required for the channel and image section of the RSS output. 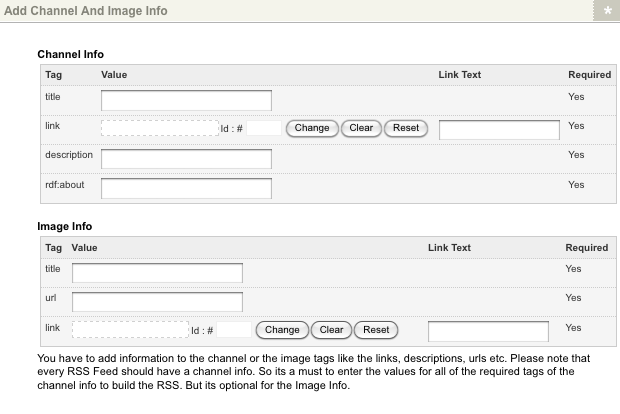 The Add Channel And Image Info section of the Build RSS screen is shown in the figure below. The channel information provides information about the RSS feed itself and can include the title, link and description. The image information allows you to specify which image will be displayed in the RSS output. The fields that are available for the Channel Info and Image Info will depend on which RSS Format you have selected on the Details screen of the RSS Feed. The Channel Info for RSS 1.0 is shown in the figure below. title: enter a title for the RSS Feed. link: enter the URL that the title of the RSS Feed will link to, for example the Asset Listing where the content is being sourced from or your site. You can select the asset to get the link from in the first field or enter the link text into the second field. If you are typing in the URL remember to include the protocol – for example "http://" - otherwise the link will not work. description: enter a description of the RSS Feed. rdf:about: enter the URL of the of the RSS Feed for your site. Tip: The Required field on the right hand side indicated whether or not the field is required. You must enter a value into the fields marked as Yes; otherwise, the RSS Feed will not work. The Image Info for RSS 1.0 is shown in the figure below. url: enter the URL of the image, including the protocol – for example http://. link: enter the URL you would like the image to link to when it has been rendered in HTML, for example your site. You can select the appropriate asset from the Asset Map in the first field or enter the link text into the second field. If you are typing in the URL remember to include the protocol – for example http:// - otherwise the link will not work. Tip: The Required field on the right hand side indicated whether or not the field is required. If you enter a value in one field under the image Info section, you must enter a value into the fields marked as Yes; otherwise, the RSS Feed will not work. The Channel Info for RSS 2.0 is shown in the figure below. title: enter a title for the RSS Feed. This may be the same as the name of the Asset Listing. link: enter the URL of the page that corresponds to the content in the RSS Feed. If you have included only one Asset Listing, you may use the URL of that page. If you have included a number of Asset Listings, you may use the URL of the site. You can either select the appropriate asset from the Asset Map in the first field or enter the link text into the second field. If you are typing in the URL remember to include the protocol – for example http:// - otherwise the link will not work. pubDate: enter a published date for the content of the RSS Feed. lastBuildDate: enter the date the content in the RSS Feed was last changed. language: enter the language of the RSS Feed, for example en-au which is English (Australia). copyright: enter the person or company who owns the copyright of the content in the RSS Feed, for example Squiz Pty Ltd.
webMaster: enter the name and email address of the person who is responsible for the RSS Feed, for example John Smith <email@squiz.com.au>. managingEditor: enter the name and email address of the person who is responsible for the content in the RSS Feed, for example John Smith <email@squiz.com.au> . category: enter a category that the RSS Feed belongs to, for example Newspapers. generator: enter the name of the program that generates the RSS Feed, in this case it is Squiz Matrix. ttl: stands for time to live. Enter the number of minutes before the RSS Feed is refreshed. This refresh time is for the RSS reader the user is using, not for your site. Tip: The Required field on the right hand side indicates whether or not the field is required. You must enter a value into the fields marked as Yes; otherwise, the RSS Feed will not work. The Image Info for RSS 2.0 is shown in the figure below. This section allows you to add an image to the RSS output. The fields available in this section are as follows. link: enter the URL you would like the image to link to when it has been rendered in HTML, for example your site. You can either select the appropriate asset from the Asset Map in the first field or enter the link text into the second field. If you are typing in the URL remember to include the protocol – for example http:// - otherwise the link will not work. description: enter a description of the image. weight: enter the width of the image. The standard default width is 88, with the maximum being 144.
height: enter the height of the image. The standard default height is 31, with the maximum being 400. Tip: The Required field on the right hand side indicates whether or not the field is required. If you enter a value in one field under the Image Info section, you must enter a value into the fields marked as Yes; otherwise, the RSS Feed will not work. The Channel Info for Atom 1.0 is shown in the figure below. id: enter the id for the RSS Feed. This id must be a unique identifier for the feed. updated: enter the date the content or RSS Feed was last changed. link.rel: enter the link relation type. If this is left blank, the standard relation type is alternate. link.type: enter the type of the link. link.href: enter the href of the link. subtitle: enter a description or subtitle for the RSS Feed. rights: enter the person or company who owns the copyright of the content in the RSS Feed, for example Squiz Pty Ltd.
author_name: enter the name of the person who is responsible for the RSS Feed. author_email: enter the email address of the person who is responsible for the RSS Feed, for example email@squiz.com.au. category.term: enter the category that RSS Feed belongs in. category.label: enter a label for the category. category.scheme: enter the category scheme. The Image Info for Atom 1.0 is shown in the figure below. icon: enter the image for the RSS Feed. This field is required. To see the XML that is getting generated by the RSS Feed, go to the Preview screen. 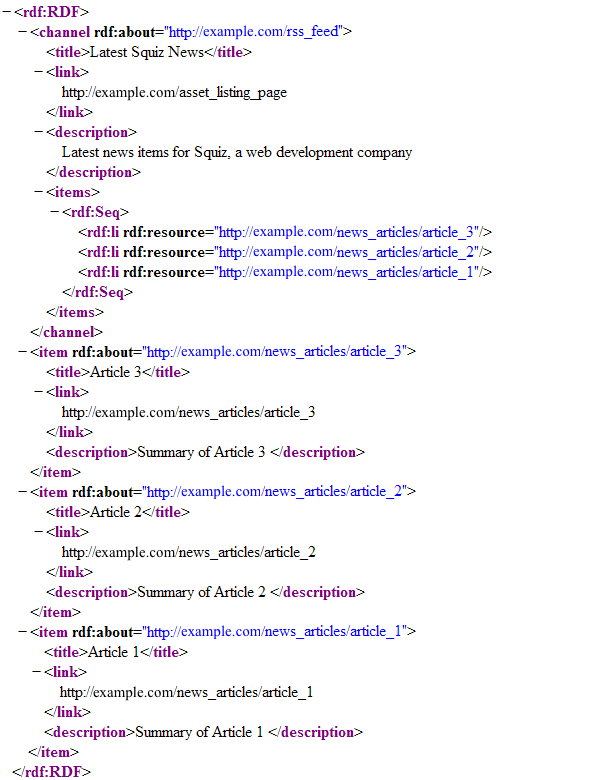 The XML that will be outputted by the asset will appear, as shown in the figure below. When you visit the Preview screen you may receive an error instead of the XML output. These errors indicate that something has not been set up correctly with the RSS Feed. Below is a list of errors that may appear on the Preview screen. No Listing Engine Assets Found To GetAssets For You have not selected an Asset Listing to source content from. Go to the Details screen of the RSS Feed and select an Asset Listing in the Listing Engine Assets Selection section. No Channel Info Or Items Found ToGenerate 1. You need to fill out the required fields in the channel info. Go to the Build RSS screen and fill out the fields marked as Yes in the Required field under the Channel Info section. 2. You to add the information you want to include for the items in the RSS Feed. Go to the Build RSS screen and add a new keyword replacement via the Add A Keyword section. Required Attribute <fieldname>Missing For Channel You need to fill out the field in the Channel Info section on the Build RSS screen. Required Attribute <fieldname>Missing For Image You need to fill out the field in the Image Info section on the Build RSS screen. Go to the Build RSS screen and ensure you have filled out each the required tags with a keyword replacement in the Keywords As Items section. For RSS 1.0 all tags are required. For Atom 1.0, title, id, updated and author name are required. To understand how the RSS Feed works consider the following example. We are going to create an RSS Feed for the Asset Listing that is listing News Item, which was created in the previous chapter. The Asset Listing then needs to display a link to the RSS Feed so users can use it. 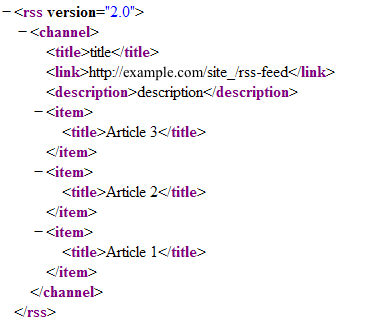 RSS Format: select the format type for the RSS Feed. Select Listing Engine Assets: select the Asset Listing. Number Of Assets To Be Added In The RSS: change this value to 10. This means that the 10 latest News Items will be included in the RSS Feed. The following sections describe the minimum number of fields that need to be set up for each format type of the RSS Feed. title: enter a title, for example Latest Squiz News. link: select the Asset Listing Page. The title of the RSS Feed will link to this page. description: enter a description, for example Latest news items for Squiz, a web development company. rdf:about: enter the URL of the RSS Feed, for example http:/example.com/site_/rss-feed. Click Commit. The keyword replacements for each tag now need to filled in. Select news_item from the list in the Add A Keyword section and click Commit. The fields shown in the figure below will appear. Select Asset Name as the keyword replacement, select title as the tag and click Commit – the Keywords Selected fields will appear on the screen, as shown in the figure below. Select the keyword replacement Short summary of the item for the tag description. This will include the summary of the News Item in the RSS Feed. Select the keyword replacement The absolute url to the asset for the tag link. Select the keyword replacement The absolute url to the asset for the tag rdf:about. Once you have done this the Keywords As Items section should look similar to what is shown in the figure below. 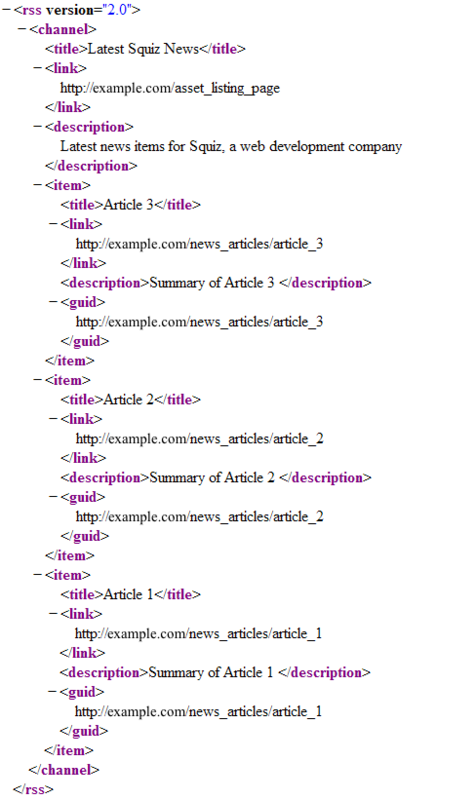 When you preview the RSS Feed, the XML that you should see will be similar to what is shown in the figure below. link: select the Asset Listing. Select the keyword replacement The absolute url to the asset for the tag guide. id: enter the URL of the RSS Feed, for example http://example.com/site_/rss-feed. updated: enter the date the content of the RSS Feed was last updated, for example 12th January 2010.
link:rel: enter the link relation type, for example self. link:href: select the RSS Feed. Select the keyword replacement Short summary of the item for the tag content. This will include the summary of the News Item in the RSS Feed. Select the keyword replacement The date when the asset was last published (ISO8601 format) for the tag updated. Select the keyword replacement Asset Attribute: contact_name for the tag author name. Select the keyword replacement The absolute url to the asset for the tag id.